If you bring us out to your location, then we will help you evaluate trees, share ideas for building the tree house, or inspect an existing tree house for safety. A meeting on site and in person is the most expedient way to make the best possible planning decisions for your project. 2 hours to 2 days of time on site to assess your options and discuss them with you. Initial design work with hand drawn sketches prepared in our office. Preparation of a construction contract if that’s the direction you’re going (most people are, but we’re happy to consult for DIYers as well). Site Visit Consulting Engagements in the continental USA generally cost between $500 and $6500 for the above services. Please call for details on trips outside of North America . 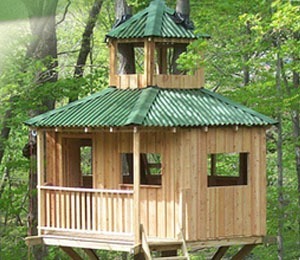 For additional tree house consulting services, consider our Virtual Consulting or Contact Tree Top Builders for more information.